The long-awaited MG Aegis, possibly the most anticipated of the remastered Seed machines ever since Duel was first released. I was personally like a little boy at Christmas when I first saw reviews of this kit online; everything was gorgeous to me. 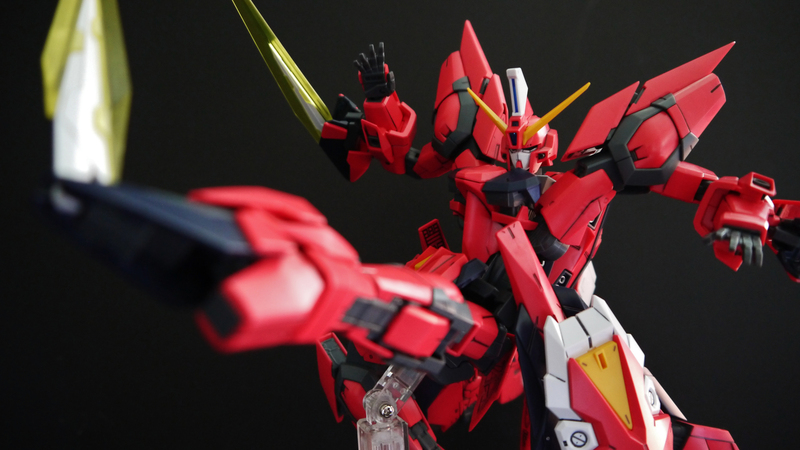 The Aegis has always been one of my favorite suits from Seed, right up there with the Duel and Strike. The redesigned MG treatment was so very welcome. As with its brother units that received similar MG treatments, Aegis has a very confident and strong stance. Proportions are fantastic, details are abundant, just like the rest. I have to say though, while many reviewers claimed the Aegis to be “incredibly stable! Like a brick!” it isn’t actually quite as stable as its brother units. I mean as transformable kits go, it’s pretty darn solid, but nevertheless you do get a little flippity-flop here and there, mostly in the giant side-skirts and waist section. The joints are fairly solid in their own right, especially in the arms and legs. 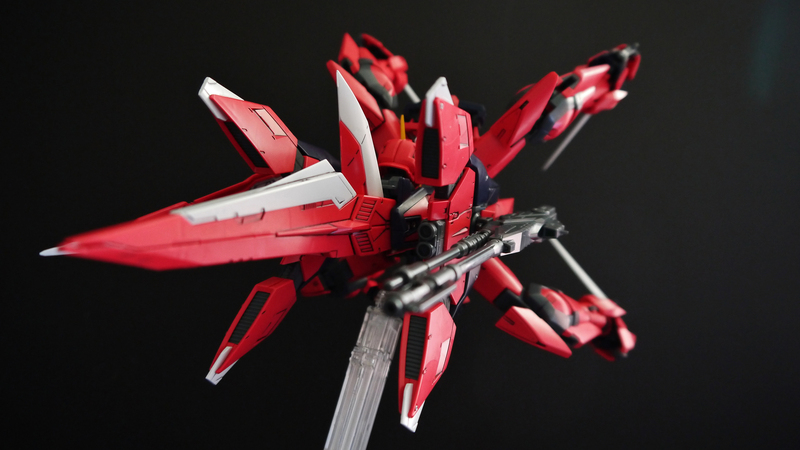 However, a lot of stuff that normally wouldn’t move on a non-transformable kit swings all over the place on the Aegis. The color of this suit was always up for a lot of controversy. Some people disliked it for being pink, others called it salmon, still others argued that it was supposed to be deep red, etc. 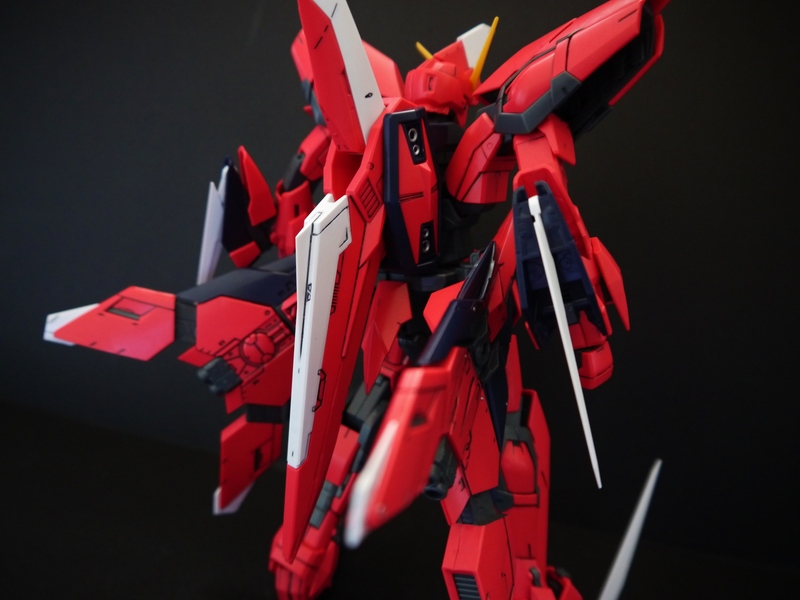 The actual Master Grade model is molded in a dark pink/light red. 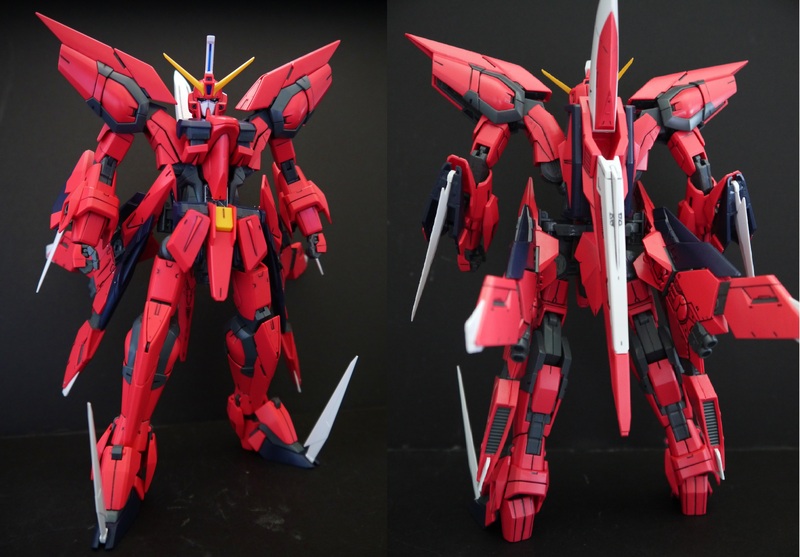 It’s certainly darker than the original 1/144 and 1/100 kits, not quite as light pink. 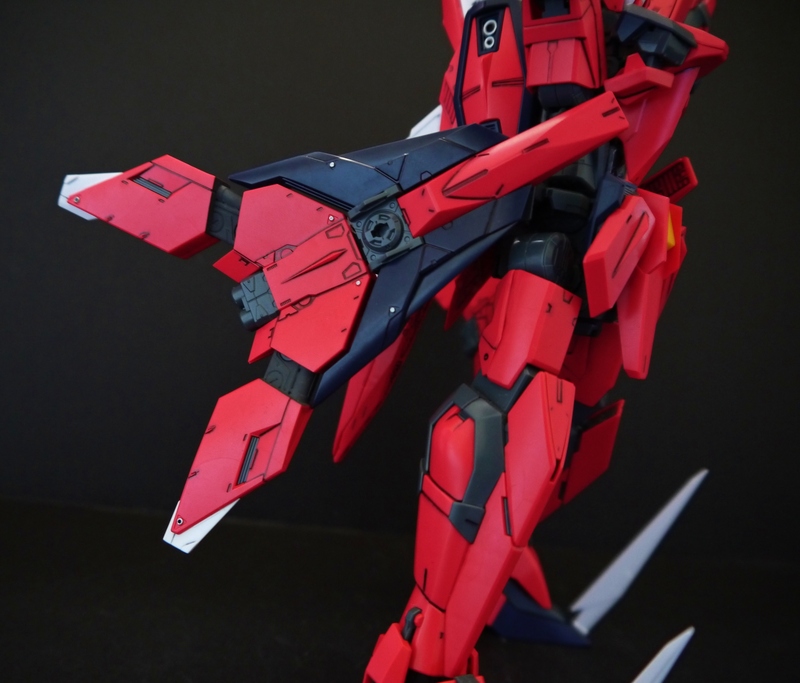 However, looking at the line art, which paints Aegis in a dark maroon-esque hue, it wouldn’t have hurt to do the same on the actual kit. Nevertheless, it really doesn’t look bad. The unique color makes the suit stand out. 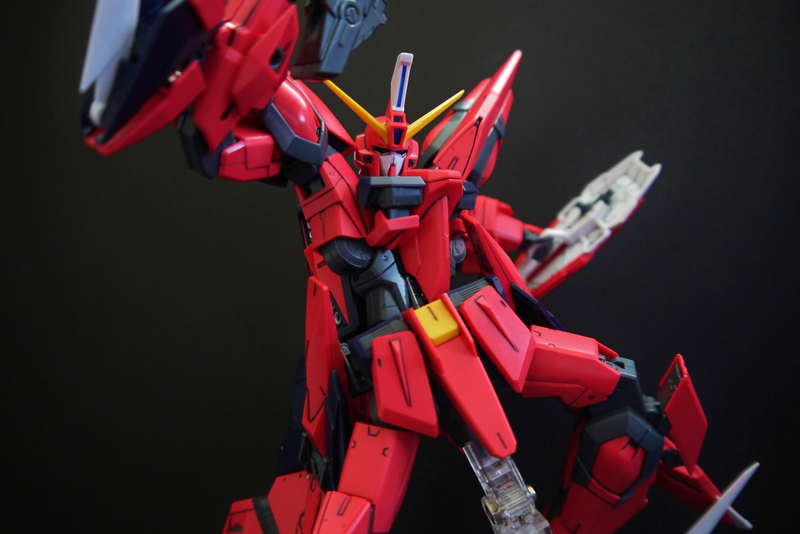 Articulation is generally the same as the previous MG G Machines, or in other words, very impressive. 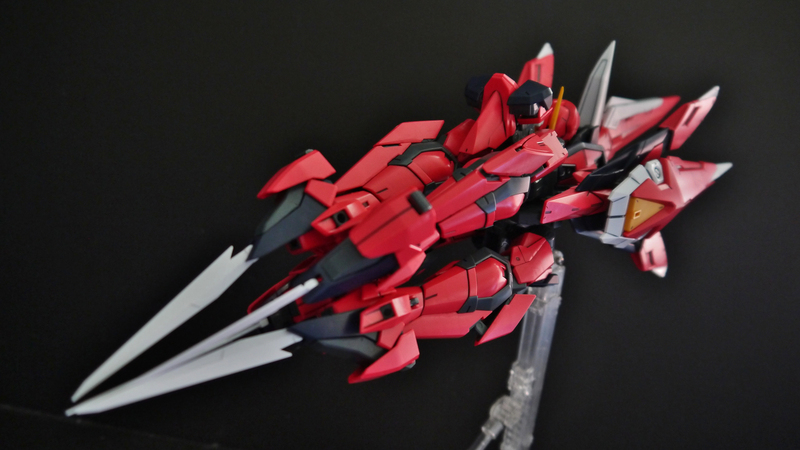 The Aegis is unique in that it has a little more in some areas though, due to its transformable nature. 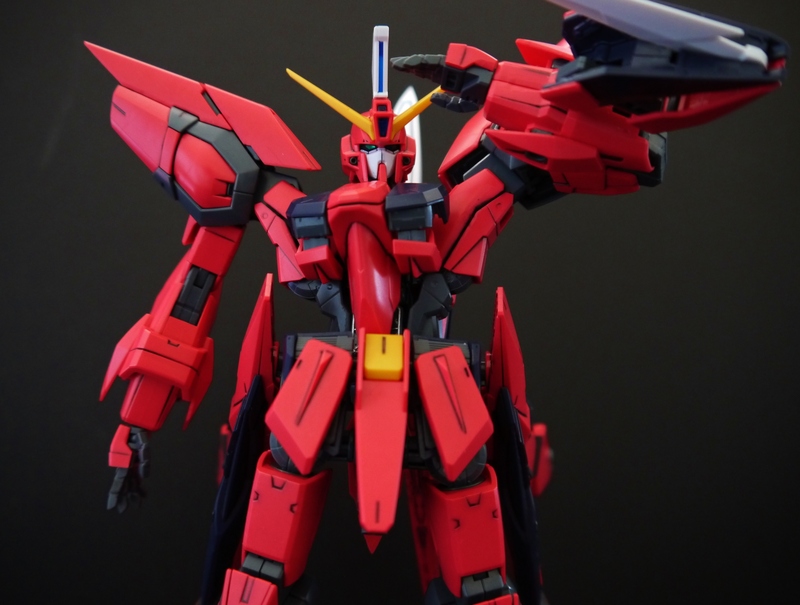 The shoulders are actually two joints, meaning it moves at the normal shoulder joint next to the head, and it also connects to a movable section in the torso. The torso/chest is essentially split up into several moving sections instead of the usual solid block. Not gonna lie, while the massive side-skirts are extremely well detailed and look beautiful, they are rather cumbersome. It can get a bit annoying adjusting them all the time according to the Aegis’ pose, but at the very least Bandai’s improved by miles with their stability. 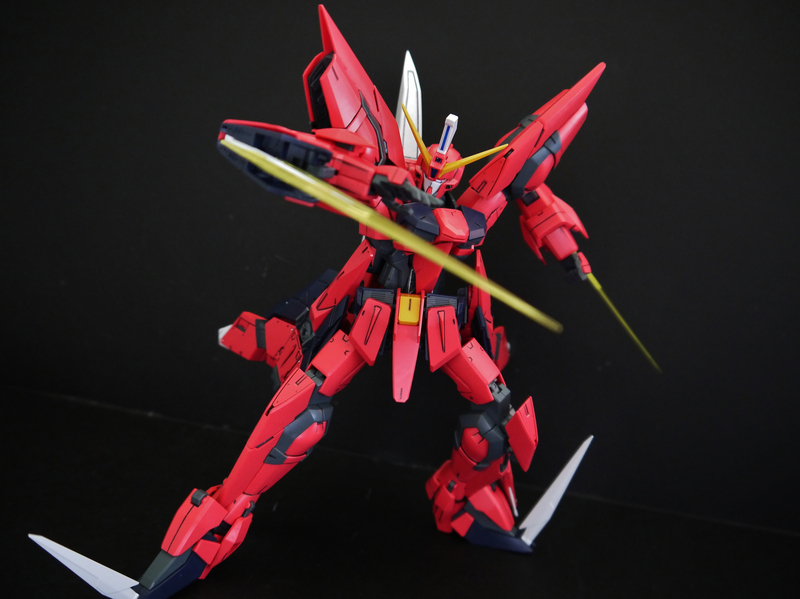 Back in the day, on the old 1/144 and 1/100 kits, these things were prone to so much breakage and flopping around, it drove almost every Guntoka crazy. However, Bandai’s implemented something new and very impressive: a locking joint mechanism inside the joint that moves it. You get these little gear-like prongs in the side-skirt connectors, so if you want them to stay fixed, just push it into one of the slots, or you can pull it out slightly and it’ll have a free range of movement again. I have to give them props for actively trying on these pieces to make them more stable and less of a nuisance, even if they are kind of over-sized. They can also bend outwards slightly in the middle and the thrusters at the end can pull out to reveal the gray inner detail shown above. Plenty of impressive detail throughout the kit. I feel like Bandai went overboard with the Aegis’ mechanical detail in contrast to the other G Machines. Just look at them side-skirts! Some basic beam rifle and shield action. I have to say, one of the most disappointing aspects of this kit is its inability to hold its own gun. The Aegis, in almost every model kit incarnation, has always had problems holding onto its own basic weapon. This is partial to the gun being stupidly long and the hands not being able to support the weight. 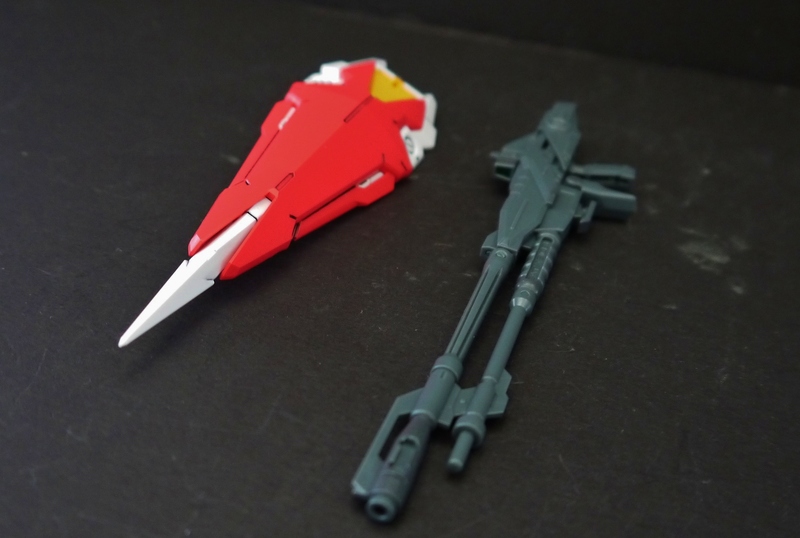 I can see where Bandai made the attempt to actually fix this with a peg in the hand and a slot in the handle, but the sheer length of the gun means that even if you do manage to get the rifle in the hand, the wrist will sag and the Aegis can’t even aim with it. Kind of a big disappointment, especially given how cool the gun actually looks, but I’ve mostly relegated it to just sitting in storage on the side-skirts. The beam rifle itself can actually also extend outwards near the handle, making the gun even longer than it already is. There’s also a pretty cool GAT-X303 inscribed on the lower barrel. The shield is also pretty difficult to get in the hand; when you finally do manage to get the handle slotted though, there aren’t really any weight issues unlike the gun. It can also peg into the forearm as standard fare. Something I’m pretty pleased with the Aegis though, is its head design. It looks pretty darn gorgeous, and the clear blue paint I tried for the first time on the forehead sensors turned out well. I’m particularly impressed by the fact that the head can actually partially transform; the V-fin can fold backwards and the top of the head moves forwards a bit. While this is more or less pointless since it doesn’t really affect the transformation much at all, its a good sign that Bandai could pull it off without much in stability or part swapping issues. 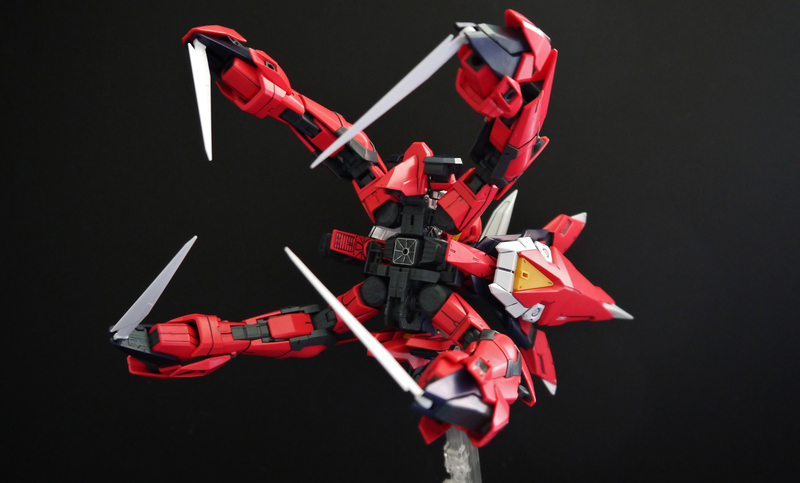 Aegis’ arms and legs were also meticulously designed to look almost completely identical to each other. They’re built differently, but Bandai really went out of their way to make them look ascetically the exact same. The shoulders even have an opening panel to replicate the knees. I can understand making something look uniform, but this is goes above and beyond that. The Aegis also sports very prominent heels, in a sense. Makes standing and ground posing rather interesting. 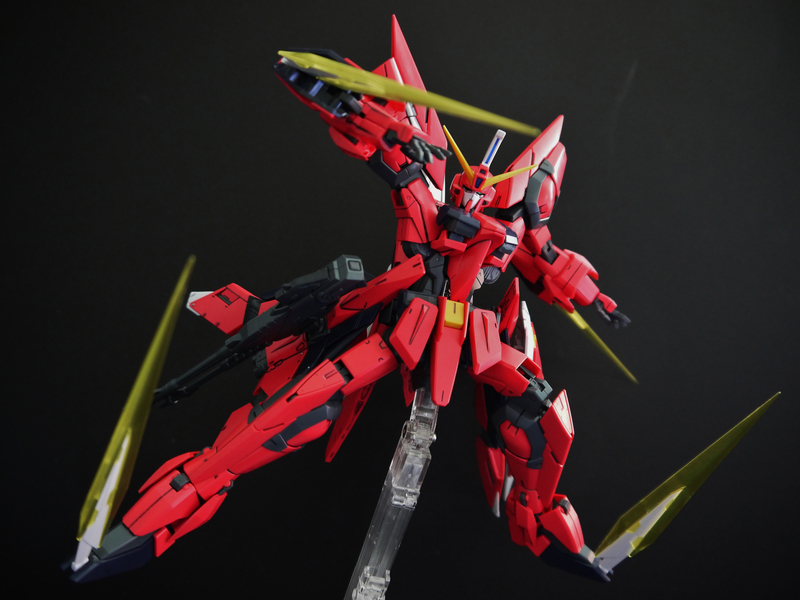 I always loved the Aegis for its interesting beam saber design. They came out of the forearms and feet, which I always found so cool. The original 1/100 kit only came with ones on the arms, but the MG took it to the next level and included all four beams. The beams themselves are molded in a beautiful clear yellow, and shaped differently than the original. They’re more sharp and dagger-esque, and slide right over the white knife-like pieces on the forearms and feet. The white pieces themselves can move around a lot as well, meaning plenty of ways to pose the beams. Dunno, I just find it so much cooler to have the beams as extensions of the limbs rather than actual swords held in the hands. Transforming the Aegis is sort of a chore. 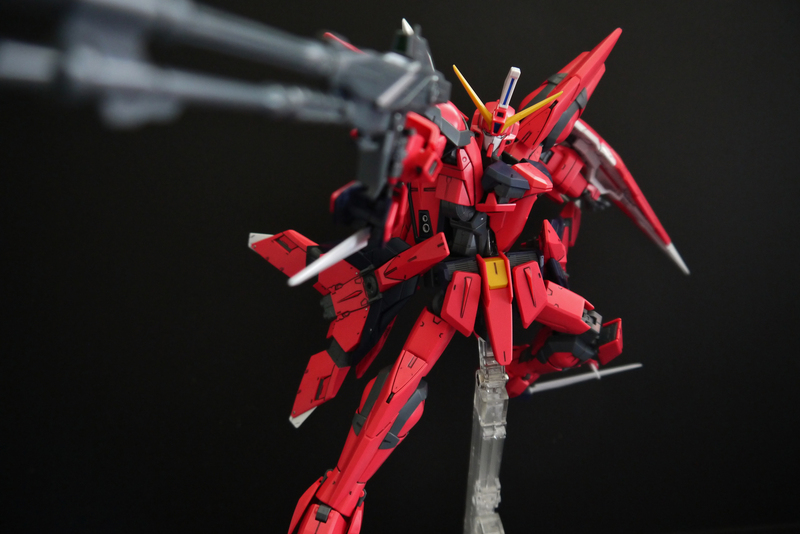 But then again, most transformations are in Gunpla. The system is a little more complex than the older incarnations of the suit, but pretty much the same. Twist the torso back to reveal the stomach cannon, rotate the limbs, flip some panels, bring the waist down, remove the hands, line everything up as best you can, and there you go. It’s rather hard to get everything to line up symmetrically, especially with the four limbs. Kinda gets irritating to be honest…still, I never really endorsed the Aegis for its mobile armor mode, so I don’t mind. I went ahead and painted the stomach cannon with some silver highlights and the works; it used to be a dull gray all around. 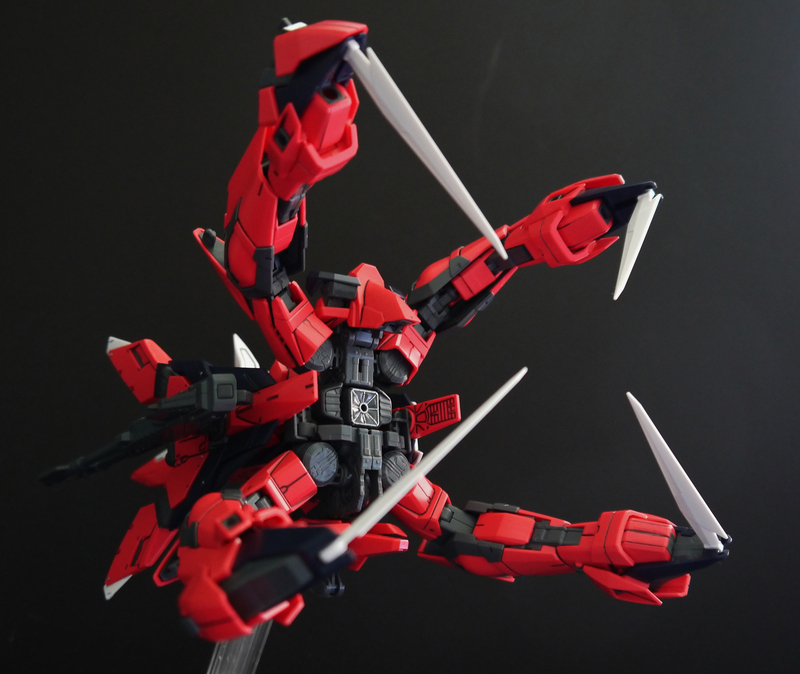 It can also turn from a giant mobile-suit eating claw into a super drill for high-speed piercing. This mode is an absolute pain to work with; lining up all the pointed ends perfectly and making the limbs stretch isn’t very fun. Something interesting to note is that the legs actually have a locking mechanism in the ankles that let the feet extend or retract for whichever mode the Aegis is in. I’m fairly certain you’re supposed to extend them for mobile armor mode, but you could also keep them out to give Aegis a little extra height in mobile suit mode. Overall the MG Aegis is a worthy kit that this suit design always deserved. 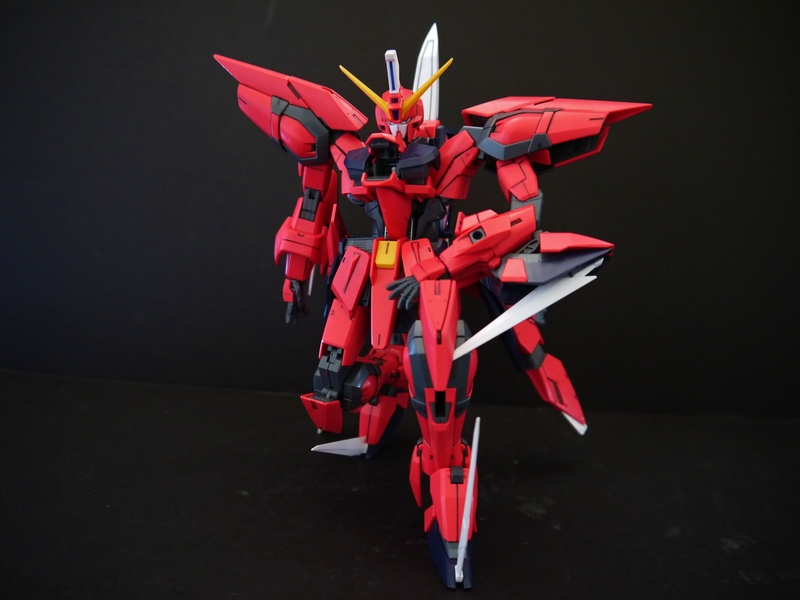 It’s very stable for a transformable suit, and while I don’t particularly care for the transformation itself, it does certainly look nice when pulled off correctly. Posing the Aegis on the ground isn’t too large of an issue; overall it can hold itself up pretty well, and while the ankles aren’t as impressive as say, the Buster, they do their job right. However, the Aegis is really meant to be up in the air. 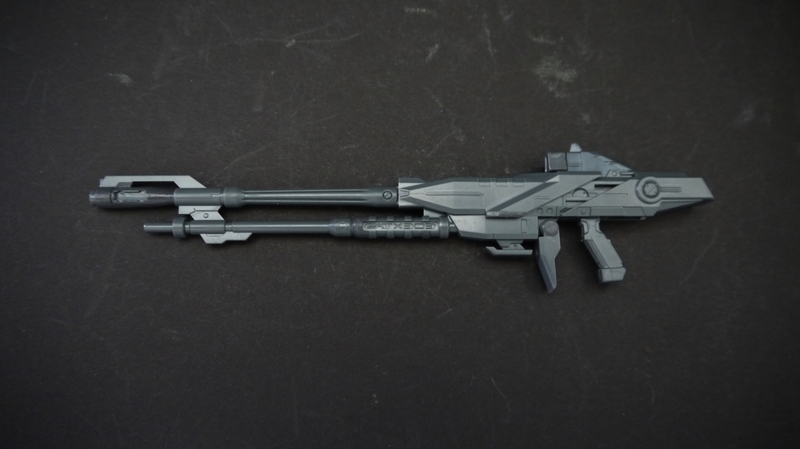 My only real gripe is the beam rifle; it really takes a lot of fiddling to get it to look even decent. Still, all things considered, this is a great model, and definitely fulfilled my expectations when eagerly awaiting this kit. Incredible detail, stability, and fabulous articulation are the norm for the remastered Seed kits.